We accept Personal Checks (10 days to clear), Cash or Wire Transfer for Domestic purchases. A 1937 John Deere Model B Tractor with plow. Completely restored about 15 years ago, complete and running. New tires, includes a vintage single bottom plow. 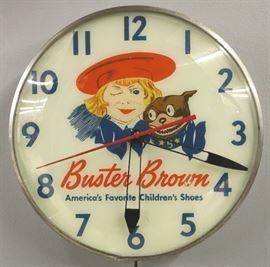 A mid 20th century Buster Brown Shoes Advertising Clock. Round, electric clock reads "Buster Brown America's Favorite Children's Shoes" on dial. Clock runs and lights up, some wear. 14 3/4" diameter. A late 19th century Stained Glass Transom Window. Multi color scroll, flower, and fruit design with cabochon and faceted glass accents in a painted wood frame. Some cracked panels, one small piece of glass has been replaced. 64 1/2" x 28 1/4" high. An early 20th century Ford Motor Company Porcelain Sign. 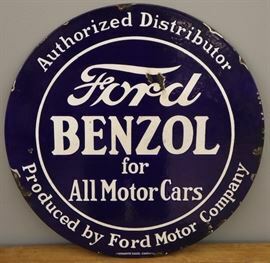 Round, double sided sign reads "Authorized Distributor Ford Benzol for All Motor Cars Produced by Ford Motor Company", and marked "Veribrite Signs Chicago". Wear and several chipped areas. 24" diameter. 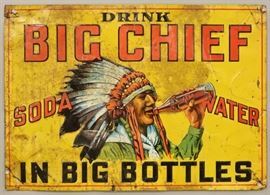 A 1920's-30's Big Chief Soda Water Lithographed Tin Sign. Rectangular, embossed, single sided sign reads "Drink Big Chief Soda Water in Big Bottles". Wear and some surface grunge, some denting, creases and hanging holes. 27 1/4 x 19 1/2" high. 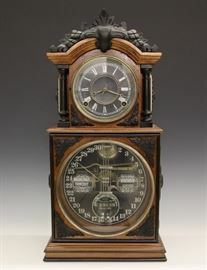 A late 19th century American double dial shelf clock. Southern Calendar Clock Co. "Fashion No. 4" model. 8-day spring driven time and strike movement with seconds bit and lower calendar mechanism, marked "Seth Thomas Clock Co. ... Solely for the Southern Calendar Clock Co.". Walnut case with single arched door. Original finish with minor wear, original gilding on dial surround. Running when cataloged. 32 1/2" high overall. 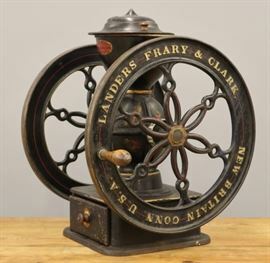 A late 19th century Landers, Frary, & Clark Coffee Grinder. Counter top model in painted cast iron with remnants of stencil decoration, turned wood handle, and painted wood drawer, and turned wood knobs. Marked "Crown Coffee Mill Made by Landers, Frary, & Clark New Britain Conn. U.S.A." along with "90" on the cover. Wear and some losses to the paint and decoration. 25 1/2" high. 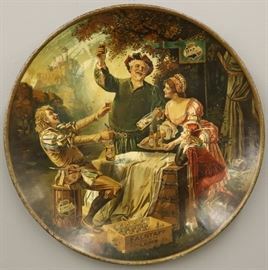 A 19th century Black Forest Cuckoo clock attributed to the Philip Haas Clock Co, St. Georgen, Germany. Brass 14-day spring driven time and strike movement with gong and cuckoo. Walnut case with hand carved Pheasants, porcelain dial numerals and carved bezel. Partial paper label on back. Old dark finish with some wear, minor loss to the carving. Running when cataloged. 33" high overall. A late 19th century Seth Thomas Office Calendar No. 3 "Peanut" wall clock. 8-day time and strike movement with painted metal dials. Rosewood case with shaped door. Original label and "S T" hands. Old finish with slight wear, nicely restored calendar dial. Running when cataloged. 23 1/4" high overall. A 1932 Coca-Cola Porcelain Sign. Rectangular double sided "Drink Coca-Cola Delicious and Refreshing" marked "Made in U.S.A. 1932" and "Tenn. Enamel Mfg. Co.". Wear and loss to the porcelain, some touch-ups. 60" x 36 " high. A pair of 19th century American Victorian Period Gothic Revival Butternut shop cabinets. Two piece design with stepped, molded cornices above carved friezes and two glazed doors flanked by spiral turned column with carved capitals and two lower drawers on bases with two paneled doors flanked by Gothic pilasters on stepped molded bases. Older refinishing with minor wear, replaced upper shelves and Brass hardware. Each 58 1/2 x 24 1/2 x 108" high overall. A late 19th century William N. Brockway, Two horse, Three Seat Surrey. With two lanterns, fringed top canopy and three brown tufted leather seats. Good original condition, shows wear that is to be expected from age and use, corrosion, some finish loss. 96" h, 66" wide, 132" long (wheel to wheel), 240" long overall. A late 19th century Baird's Advertising wall clock. Lettering on case reads "Jolly Tar Pastime, Old Honesty, Plank Road, Compliments of John Finzer & Bro's". 8-day time only Seth Thomas movement with a papered metal dial. Old finish with painted lettering, and wear, dial very discolored. Running when cataloged. 30" high. A 19th century C.H. Woodruff & Co. Floor Model Coffee Mill. Painted cast iron coffee grinder; marked "Manf'd by C.H. Woodruff & Co. Elgin, Ill. Elgin National Coffee Mill". Lacks a handle, wear and some touch-up to the paint, some corrosion, lacking cover; the casters are a later addition. 61 1/4" high overall. A Racine Sattley Hit and Miss Engine. Marked "The Racine Sattley, Montgomery Ward & Co., New York, Chicago, Kansas City, Fort Worth Portland No. 13764 H.P. 7 Speed 375", on a later iron cart. Restored and repainted with some wear. 59 1/2" h x 113" long. An early 19th century French Bronze Empire Period mantle clock. 8-day time and strike movement with engine turned dial and silk thread suspension. Two tone Bronze case with acanthus leaf and floral detail, lower tablet with Old Man Time. Some case wear particularly to the Brown patinated areas, movement appears to be complete but lacks pendulum. 17 1/2" high. A turn of the century one horse open Carriage. Open top with single black tufted leather seat. Lacking canopy/cover; modified and marriage piece (chassis has been adapted for a motor), lacking shafts, repainted portions, losses to leather, paint, etc.. Approximately 62" h, 64" w, 102" long. 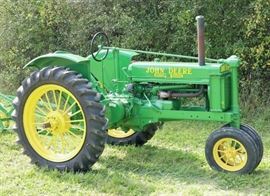 A 1952 John Deere Model 40 Tractor with plow. Older restoration, complete and running, includes a vintage single bottom plow. 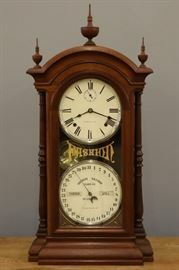 An early 20th century Differential Clock Co. wall clock with 1 year duration. Robust brass time only movement with dual springs, painted metal dial having Arabic numerals and seconds bit. Includes the original iron winding crank. Mahoganized case with original dark finish, single door with "Differential Clock, Runs one year - One winding" in Gold lettering on lower glass. Original dark finish with wear and some veneer damage. Running when cataloged. 41 3/4" high. 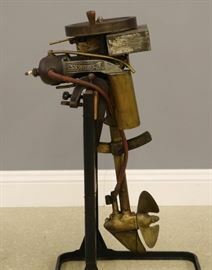 A late 19th century Woodruff & Edwards Co. Coffee Grinder. Painted cast iron coffee mill, turned wood handle; marked "Woodruff & Edwards Co. Elgin, Ill." and "Elgin National Coffee Mill". Wear and losses to the paint, some areas appear to have been repainted (the hopper, etc. ), the spokes on one wheel are cracked. 27 1/2" high. A 1913 NCR Model 317 Brass Candy Store Cash Register. Wear and minor damage, lacks marquee. 17" high overall. A late 19th century Enterprise Coffee Grinder. Counter top model in painted cast iron with Eagle finial, remnants of stencil decoration, turned wood handle, wood drawer, and porcelain knobs; marked "Enterprise Mfg. Co. Philadelphia U.S.A.", and "Pat. July 12. 98." along with "No. 9" painted on the wood drawer. Wear to the paint and decoration, some minor damage and touch-up. 28" high. A late 19th century Child's Sleigh. Painted wooden body on a restored iron base. Wear overall with minor damage to the wood. 89" long overall. A 19th century Fairbanks Coffee Mill. Painted cast iron floor model coffee mill, marked "Fairbanks Standard Mill Chicago Ill.". Replaced metal cover and hopper which show some indentations, lacks handle, wear to the paint, some corrosion, lacking a bolt (at one corner that connects it to the base). 64 3/4" high. A late 19th century American Harrow Co. (Detroit) cast iron Tractor Seat. Wear, surface rust. 14 1/4" long. 15 5/8" w x 14 3/8" d.
A 19th century Cast Iron Toy Horse Drawn Fire Pumper. Includes three horses and a driver; unmarked. Significant wear, little remaining paint, wagon body with repair. 18" long. A Buddy L Pressed Steel Steam Shovel. Black painted finish with decals on the sides. Wear/losses to the paint. 19" long. A late 19th century Stained Glass Transom Window. Multi-color foliate design with cabochons and beveled glass accents in a wood frame. Some cracked panels, minor frame damage. 57 1/2 x 19" high. A turn of the century Wooden Games Box. Rectangular box with hinged cover made of Walnut, Ash and Maple. Marked "Charles H. Taddai - Keep Out" on top edge. Wear and minor damage. 20 1/8" x 10 7/8" high. 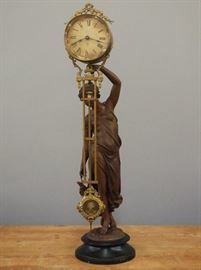 A late 19th century New Haven "Lena" model shelf clock. 8-day spring driven time and strike movement with a painted metal dial. Walnut case with a pediment top and single long door with original reverse painted glass. Older refinishing with wear and minor damage, some flaking to paint, pendulum rod repaired. Running when cataloged. 36 3/4" high overall. An early 20th century Steel Ship's Lantern by Telford, Grier, & Mackay Ltd., 16 Carrick St. Glasgow. Significant wear, several old repairs. 21 1/4" high. A 1939 Johnson Model MS 39 Motor. Marked "Johnson Motors Waukegan, Ill. U.S.A.". Old finish with significant wear. 32 1/2" high. A 20th century Cast Iron Figural Hitching Post. Repainted Black with some wear. 49 1/2" high. A 1920s Keystone Pressed Steel Toy Dump Truck. Black painted finish with red accents, operating dump bed with tailgate and chute door. Original decals include one at the front that reads "Keystone Packard Pat. Dec. 15 1925 Made in Boston". Significant wear, corrosion. 27 1/2" long. A Pair of late 19th century Stained Glass Transom Windows. Multi color glass with clear bevels and cabochon glass accents in oak frames. Some cracks to the panels, light wear overall. 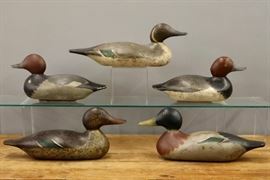 Each 60 1/4" x 21 1/4" high overall. A late 19th century Transom Window. Multi color glass with clear circular bevels in a painted wood frame. Some cracks to the panels. 76 3/8" x 24 5/8" high overall.